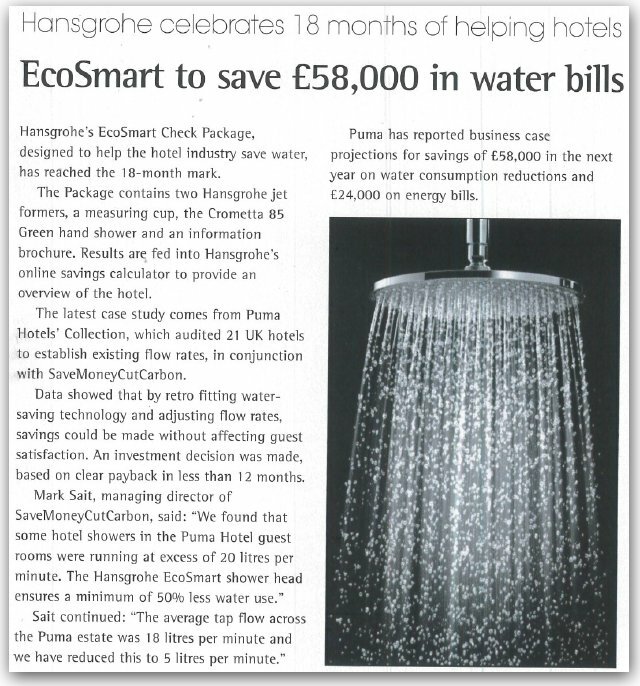 Mark Sait, managing director of SaveMoneyCutCarbon is quoted in Puma Hotels case study story published by Kitchens & Bathrooms News magazine January 2014. Mark Sait advises in the report: “We found that some hotel showers in the Puma Hotels group were running in excess of 20 litres per minute. The Hansgrohe Ecosmart shower head ensures 50% less water use. Case study update: Puma Hotels has now reported more than £100,000 savings inside eight months on initial water-saving investment of £65,000.